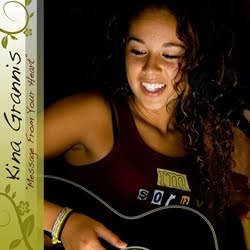 I first heard of Kina Grannis during the Superbowl a few years ago. Doritos had a contest for up-in-coming performers to submit themselves singing, playing, what-have-you and three were chosen to sing for a short commercial during the game. Then watchers could get online and vote on their favorite. I LOVED Kina Grannis' original song "Message from Your Heart." It's spectacularly written and just a great song (I still have it on my iPhone!). She recently released an album called Stairwells and although she changed up the tempo from the original "Message from Your Heart" the album is pretty awesome. Her sound is mostly acoustic and you can best describe her as a Jack Johnson/Colbie Caillat mix of sorts. Go buy it on iTunes! Or if you want a few songs, I'd download "Valentine," "Stay Just a Little" and "Together."